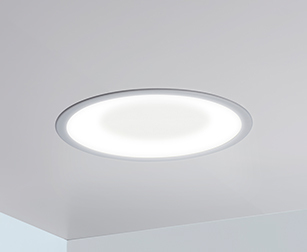 With the same patented dome shape and even greater flexibility, the Symmetry family’s new smaller fixture fits a 2x2 ceiling space. Symmetry is primed to optimize commercial and institutional applications with beautiful, functional light. Optional tunable capabilities and disinfection models powered by Vital Vio technology distinguish this luminaire as a design necessity. As a round ceiling luminaire with a graceful profile and patented concave lens, Symmetry is an ideal solution for Vital Vio’s continuous disinfection technology. Originally designed for hospital patient rooms, this fixture's unique design lends itself to many other applications. Vital Vio's continuous disinfection technology emits a germicidal frequency to protect indoor surfaces from harmful bacteria. Because this technology produces safe light that is truly white, White Light Disinfection® mode can be used continually throughout the day without halting busy environments. Eco Mode, a violet light with boosted germ-fighting power, is still harmless but ideal for intervals when illumination is not needed. Come see Symmetry at #LFI2018!